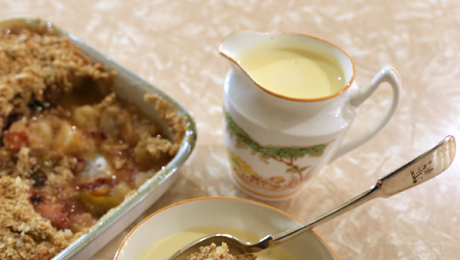 If you love custard then why not try to make some yourself at home. Whisk all ingredients except the milk and cream together until well mixed. Heat 2 cups of milk and a dash of cream to boiling point. Take off cooker, let cool a little, add to egg mixture stirring all the time. Pour mixture through a sieve back into pot and put back on cooker on a very low heat. Keep stirring with a wooden spoon until mixture coats the back of the spoon.